PharmaLive > Stocks > The End of the Health-Care Stock Surge? The End of the Health-Care Stock Surge? 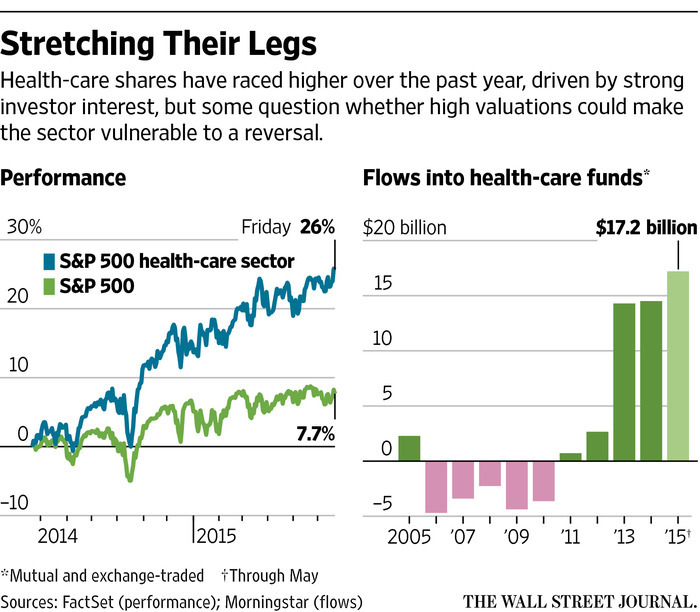 The thriving health-care sector is starting to look too rich for some investors’ taste. Health-care companies in the S&P 500, ranging from health insurers to medical-device makers to biotechnology firms, have risen 26% in the past year. That is the largest increase among S&P 500 sectors and more than three times the 7.7% gain in the S&P 500 in the same period. Strong earnings and revenue have fueled the gains, helping the sector to stand out at a time when some industries are suffering declines. A wave of large buyout deals also has boosted share prices, with the latest being Anthem Inc.
& Co. up 20% this year. Yet while investors largely remain upbeat on the sector’s prospects, the scale of the gains is raising concerns that health-care shares are vulnerable to a reversal, a pattern that has repeatedly hit highflying sectors during the stock market’s six-year advance amid near-zero interest rates. “The overall challenge in health care is frankly valuations,” said John Buckingham, who oversees about $750 million as chief investment officer of Al Frank Asset Management. Health care is the second-most-expensive sector in the S&P 500, trailing only telecommunications stocks. Health-care stocks in the S&P 500 are trading at 23.4 times the past 12 months of earnings, according to FactSet. The 10-year average is 16.7. Valuations on the S&P 500 are also elevated, but not to the same degree. The S&P 500 is trading at 18.4 times the past 12 months of earnings, higher than its 10-year average of 15.8. Mr. Buckingham said he recently sold shares of Eli Lilly and St. Jude Medical Inc.
“Lilly had been great to us, and the prospects look pretty good, but when you’re talking about a stock trading at 28 times earnings, that’s too rich for us,” he said. For now, many investors are willing to ride out any market choppiness. For health-care stocks, “the valuations are higher, but the valuations relative to the growth outlook are still attractive,” said Steven Schroll, who helps manage the $1 billion Columbia Global Equity Value Fund at Columbia Threadneedle Investments. 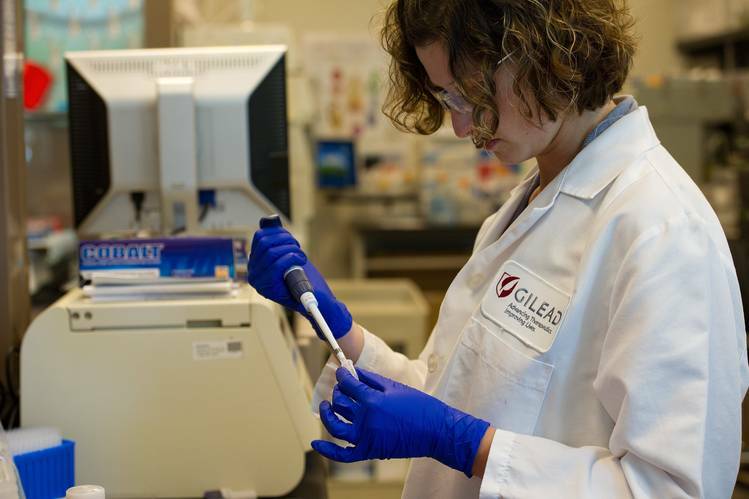 Shares of health-care companies, including Gilead Sciences, are among the best performing in the U.S. this year. Investors have poured $17.2 billion into health-care mutual and exchange-traded funds this year through May, up from $14.5 billion for all of last year, according to data from Morningstar Inc. Hedge funds and mutual funds now hold larger health-care positions than relevant market indexes, according to Goldman Sachs Group Inc.
An aging baby-boomer population and the Affordable Care Act are boosting health-care spending, bolstering corporate bottom lines. 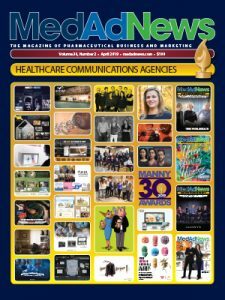 Companies in the pharmaceutical and biotechnology subsectors have also increased profits as they discover cures for previously untreatable diseases. Revenue for the S&P health-care sector surged 10.7% from a year earlier in the first quarter, versus the overall 2.9% decline in revenue at S&P 500 companies. Revenue growth at health-care companies was roughly 12% in each of the last three quarters of 2014, while the broader S&P revenue growth came in below 5% in each of those periods. Yet one threat to health-care stocks could come from a broad resurgence of the U.S. economy, said Fred Weiss, who helps manage about $1 billion in Atlantic Trust’s midcap growth equity strategy. Stronger U.S. growth could fuel a surge in earnings across other, lower-valued sectors, making it harder for him to justify paying up for health-care stocks just for their earnings growth, he said. Economic indicators have picked up this month after an early-year slowdown. “If we get 4% GDP [growth] year after year after year you can buy a lot of other sectors and get great earnings growth,” Mr. Weiss said. Another concern: The sector could be hit in any period of market tumult, possibly spurred by concerns over Greece’s finances or bond-market volatility. Some investors worry that so-called crowded trades, or sectors that have received large inflows and in which investor sentiment is positive, can fall sharply during periods of market stress. The Nasdaq Biotechnology Index slid 9.1% from April 23 to April 30. That decline came as data revealed disappointing first-quarter U.S. growth, which was subsequently revised to a contraction, and subdued inflation. The Nasdaq Composite Index fell 2.3% and the S&P 500 fell 1.3% in the same period. Monica DiCenso, U.S. head of equity strategy at J.P. Morgan Private Bank, holds shares of pharmaceutical companies and small- to midcap oncology companies. She shrugs off worries about a sudden downturn in the health sector because it is overextended. “These are momentum sectors, and that’s how they move,” said Ms. DiCenso, referring to biotech. She said she added to her biotech position during the April selloff. But she is cautious about some insurance and hospital companies given an upcoming Supreme Court ruling related to health care and ahead of next year’s presidential election, in which a Republican win could result in changes to health-care laws. The Supreme Court is deciding whether insurance subsidies under the 2010 health law can go only to residents of states that opted to set up their own health-insurance exchanges and not to residents in the majority of states that use the federal government’s exchange.